As outlined in our previous blog post, this summer we partnered with the Stratford Parks and Recreation Department for “FVC’s Eye Spy Fun in the Sun” initiative with the goal of educating parents about protecting their children’s eyes from the summer sun. The collaboration was a homerun! 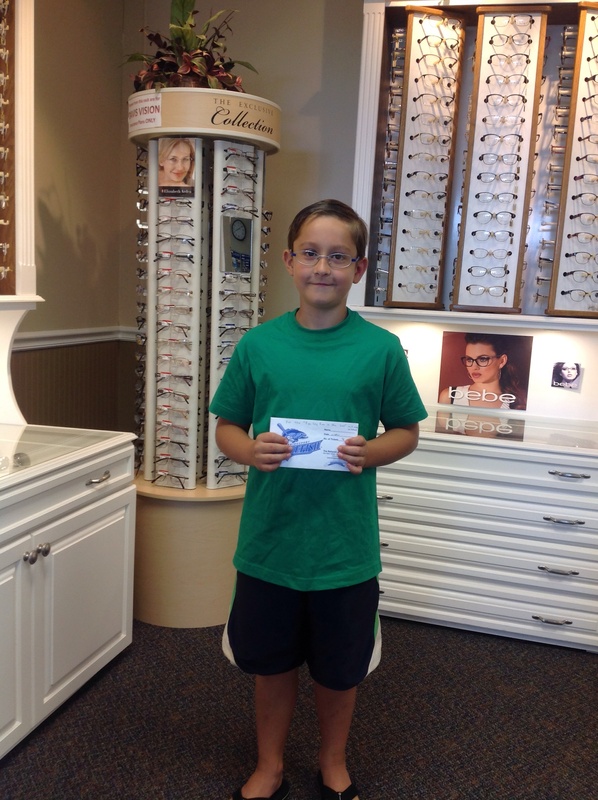 Family Vision Center is proud to announce that the winner of the Eye Spy drawing is Stratford’s own Nick Fama! He and his family will enjoy an upcoming Bridgeport BlueFish baseball game. Congratulations, Nick! 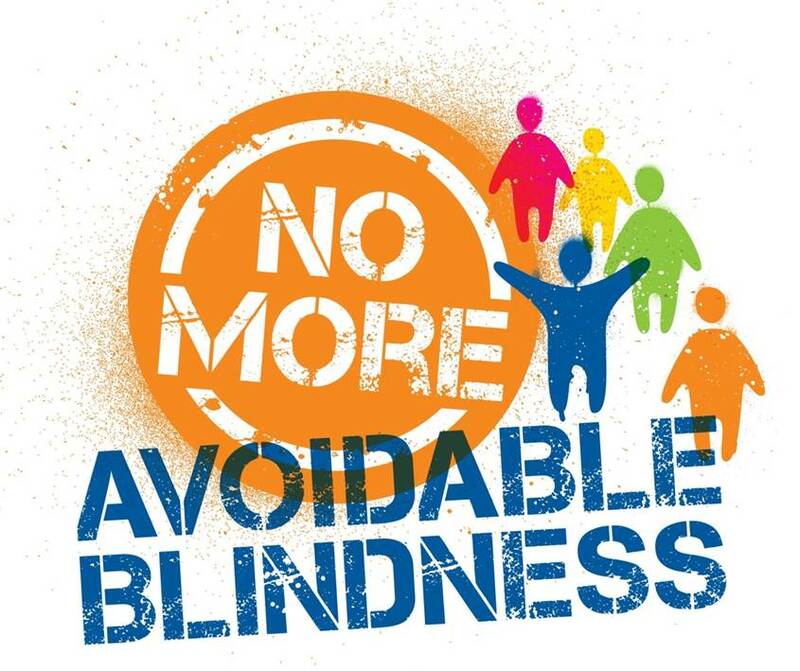 Did you know that too much exposure to UV light in children increases the risk of eye diseases, including growths on the eye and cancer as adults? Many parents forget to look beyond the sunscreen to ensure their children’s eyesight is protected while out in the sun for summer fun. Throughout the month of July, our friends at the Stratford Parks and Recreation Department helped Family Vision Center deliver this invaluable message by distributing useful educational material through their booths at Stratford Family Day and the Southend Community Expo, and through their popular Playground Program. The community rallied around the message and eagerly took home the information to learn more about this often overlooked issue. The children participating in the Playground Program also joined the fun by participating in Family Vision Center’s Eye Spy game. Every child who completed the game turned it into their counselor to be entered in a drawing for a family four-pack of Bridgeport Bluefish tickets, which is how Nick won the big prize. The eight-year-old Eli Whitney School student visited the Stratford Family Vision Center office to pick up his tickets and to express his gratitude for the opportunity to attend a Bluefish game with his family. He also spoke fondly about his time at the Stratford Playground Program, citing the friendships he made as the highlight. When we asked Nick why it’s so important to wear sunglasses and take care of your eyesight he replied, “so you can see well.” We couldn’t agree more! We are extremely appreciative of Nick, his family and Stratford Parks and Recreation for being part of “Eye Spy Fun in the Sun” and helping Family Vision Center spread this educational message throughout the community. 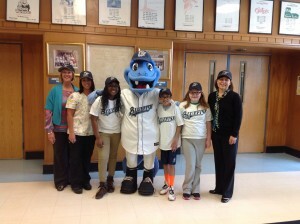 Family Vision Centers Partners with the Bridgeport BlueFish to Benefit a local Foundation! Family Vision Center is sponsoring the Bridgeport BlueFish’s Saturday night 3D fireworks display! Purchase your 3D glasses during the game and half of all proceeds will be donated to the Halle’s Hope foundation! Here’s a sneak peek of our commercial featuring the Bridgeport BlueFish mascot BB, getting an eye exam with Dr. Burns! 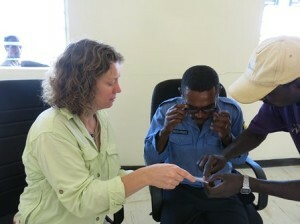 Family Vision Center Partners with New Eyes for the Needy! Family Vision Center, has partnered with New Eyes for the Needy to sponsor an eye glass and hearing aid collection drive. We are proud to work with this non-profit to empower children and adults with the improved vision they need to pursue a better quality of life for themselves and their communities! Family Vision Center will be collecting prescription sun and reading glasses, as well as hearing aids and we’re thrilled that our local schools have decided to join our efforts! A prize will be awarded to the one school that collects the greatest number of donations. New Eyes for the Needy empowers children and adults in the U.S. and overseas with the improved vision they need to pursue a better quality of life for themselves and their communities. Since 1932, New Eyes has provided clear vision to over eight million people in the U.S. and throughout the world. In the U.S., New Eyes provides prescription eye glasses to those in need through a voucher system, which is funded by donations, grants and from the sales of donated gold, jewelry, giftware and hearing aids. Last year, New Eyes helped 4,362 children and adults to see clearly through its voucher system. In developing nations where vision care is limited or non-existent, New Eyes provides reading glasses. Last year, 200 pairs of recycled glasses were distributed through eight medical missions and international charitable organizations to 30 developing nations. If you would like to donate to this wonderful cause there will be drop off locations designated in each of our two locations. If you have children who attend our local elementary schools please send any donations to school with your child. Our drive will run from Feb. 18 – March 18, 2015. We look forward to working together and thank you for your commitment to this important initiative. More Than 600 Items Collected for Family Vision Centers New Eyes for the Needy Initiative! 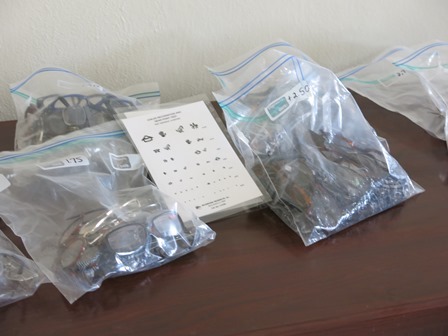 The counts are in and Family Vision Center’s eye glasses and hearing aids collection drive hit a home run! Family Vision Center recently partnered with Stratford’s local 11 elementary schools and Stratford and Milford’s senior centers to collect prescription, sun and reading glasses, and hearing aids. Patients from both the Stratford and Bridgeport Family Vision Center locations also pitched in by contributing to the drive, which ran for two weeks, ending on March 18. Over 600 items were collected and donated to New Eyes for the Needy, a non-profit working to empower children and adults with the improved vision they need to pursue a better quality of life. Stratford Academy: Johnson House took home the prize with an impressive 151 items collected! As a thank you for their dedication to the drive, each student at the school will receive a signed team photo from the Bridgeport Bluefish baseball team. Other participating elementary schools included: Chapel Street, Franklin, Lordship, Nichols, Second Hill Lane, Stratford Academy: Honeyspot House, Eli Whitney, Wilcoxson, St. Mark and St. James. All schools and senior centers collected items well into the double-digits, and Family Vision Center is grateful for the community’s involvement and eagerness to participate. Family Vision Center recently had the pleasure of fitting 16-year-old student-athlete Luke Chenoweth, Stratford, for contact lenses. Luke Chenoweth expressed interest in contact lenses when participating at the Sterling House Community Center. Sterling House reached out to us to see if we would be willing to make wearing contact lenses a reality for Luke! 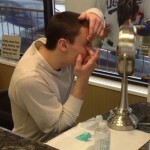 We jumped at the opportunity to give back to a local teen who could benefit from contact lenses! All we asked in return is that we could document his experience. As a young teen being fitted for contact lenses for the first time, we asked Luke to answer the following questions throughout the week of his fitting. His answers proved to be interesting, appreciative and helpful to anyone considering contact lenses. Please enjoy an insightful look into Luke’s experience and call us today to learn how Family Vision Center can help you effortlessly transition to wearing contact lenses. FVC: Why did you want to make the switch from glasses to contacts? Luke: I participate in a variety of sports including soccer, wrestling and rock climbing. My glasses can be very cumbersome when I play so I knew I’d be able to see much better with contact lenses. I was also told I looked good without my glasses, so that was also a factor. FVC: What were you most looking forward to in switching from glasses to contacts? Luke: I knew I’d finally be able to see clearly, including in my peripheral vision, which would help me improve as an athlete. I also wanted to see people better to help me gain confidence when I socialize. FVC: How long have you wanted contacts? Luke: Since I began to need to wear glasses full time three years ago. FVC: So far, what are the biggest differences wearing contacts versus glasses? Luke: For one, my prescription is newer and much better. Also, I can lie down without taking my glasses off. And I expect that when I start shaving more, it will be a lot easier. FVC: What is the best part about switching to contacts? Luke: Sports are already easier, and people have taken notice that I’m not wearing my glasses and compliment me on the change. FVC: What is the biggest challenge in transitioning to contacts? Luke: Adjusting to my new prescription and keeping my eyes open while putting them in have been slightly challenging. However, it’s only been one week and it’s already becoming much easier and part of my daily routine. FVC: Overall, how would you rate your first week wearing contacts? Luke: I’d give it a B+, simply because of getting used to the process of putting them in. It was tricky at first, but I’m already becoming an old pro! 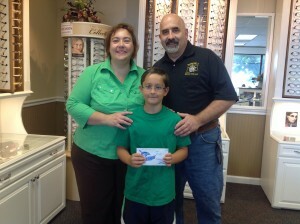 FVC: How was the overall fitting experience at Family Vision Center? Luke: I can’t say enough about Family Vision Center! I thank God that my prayers for contact lenses have been answered. I can see better, be more active without the concern that my glasses will break, wrestle with my dad, rock climb and play soccer with my friends. This experience has had a huge impact on my life and I thank God for the opportunity and Family Vision Center for making my dream a reality. Family Vision Center’s Stratford office hosted a free dry eye clinic on Nov. 18th for 15 patients on a first come, first served basis. Dry eye affects 23 million Americans suffering from symptoms including dryness, redness, burning, itching and visual disturbance*.Those participating in the clinic were asked a series of questions regarding dry eye symptoms. A certified technician conducted a LipiView screening to analyze the lipid layer of the eyes. This non-evasive test helped to determine if the patient is a candidate for the LipiFlow procedure: a new, safe and effective treatment for dry eye approved by the FDA.Family Vision Center is one of a few private optometry practices in Conn. to utilize the cutting edge LipiFlow technology. Identify and eliminate social and economic obstacles, particularly for the poor and the marginalized. For the past 20 years, Dr. Michael Gorman, Founder of Family Vision Center, has been more than just Carole Fenton’s optometrist, he’s been her friend. A longtime patient in her home-based Stratford office, Carole developed a fast friendship with Dr. Gorman based on their mutual interest in travel. This friendship later resulted in an altruistic partnership. Carole’s husband, Thomas Fenton, was also a devoted patient of Dr. Gorman’s. When they received the news of Dr. Gorman’s recent retirement, they were delighted for him, yet equally disappointed to lose their valued optometrist. The couple recalls booking back-to-back appointments and looking forward to discussing them later that day. It was because of those impressionable experiences that Carole turned to Dr. Gorman when she needed help with a charity mission last February. In 2009, Carole’s friend and Norwalk Hospital nurse Gerry Nicholls founded Ethiopia’s Daughters, a charity that works with Ethiopian schools and local communities to provide clean water and medical assistance, while improving educational programs and infrastructure. 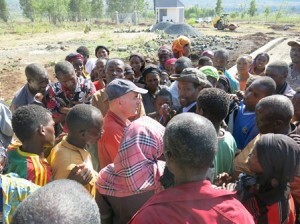 Once a year, volunteers travel to Ethiopia to assemble a clinic for a week and provide primary care-type services. After the Fenton’s signed up for the 2014 trip, Carole immediately began brainstorming about how she could contribute to the week. She recalled that Ethiopia’s Daughters had recently received a large donation of reading glasses and decided she wanted to figure out the most efficient way to distribute them to the villagers who needed them most. Carole immediately thought of Dr. Gorman and soon found herself at his office explaining the mission and seeking advice on how to best execute it. From the moment Carole approached Dr. Gorman, he was extremely passionate about the mission and understood what they needed to maximize its potential. Recognizing the people in the tribe wouldn’t speak English or necessarily comprehend what was involved with eye exam even, Dr. Gorman developed an eye chart with pictures and drawings to help them communicate the concept and determine their vision in relationship to the strength of the reading glasses. Carole was ecstatic, knowing this was exactly the solution she needed to most effectively meet the needs of the villagers. The mission was a massive success and they donated over 100 pairs of glasses that were so desperately needed. When Carole returned home, she created a photo album for Dr. Gorman, documenting the hundreds of villagers he helped. She’s looking forward to presenting it to him and telling the inspiring stories from her trip. She’s also eager to share other exciting news about her personal life—Carole is about to embark on an adventure in the form of a new job. After 18 years as a first grade teacher, Carole is about to leave that all behind to start a new career as a travel counselor. With their shared passion for travel, Carole is confident he will understand exactly why she’s making such a courageous leap to follow her heart. Dr. Gorman also supported her throughout her teaching career, rearranging his busy schedule to visit her classroom and teach the students about vision when they were conducting their yearly science lesson on the five senses. Carole continues to be a patient at Family Vision Center and values its presence as one of Stratford’s long-standing fixtures. She does not know of any other local business that’s been around as long as Family Vision Center and she credits its longevity to Dr. Gorman’s dedication, passion and genuine kindness. Carole respects Dr. Gorman for pouring his heart into his practice and will be forever grateful for having such a good man as her doctor and her friend.